Greek style honey sweetened natural yoghurt (97% fat free) with Mixed Berry. Greek style honey sweetened natural yoghurt (97% fat free) with Passion fruit Puree. A mixture of untoasted and toasted muesli, freshly sliced apple and non-fat vanilla yoghurt. Untoasted muesli, banana, cinnamon & Greek yoghurt. Traditional English muffin with Whole egg, Bacon, Relish and Optional Spinach or Cheese. Let the Nashi team select an assortment for you from our variety of gourmet crowd pleasing fillings. Filled with your choice of ham, cheese, tomato or French jam. A selection of Sandwiches/ baguettes & or Wraps (1.5 Per Person). Recommended 4-6 people. Recommended 1 for 6 people..
A selection of Sandwiches/ baguettes & or Wraps (1.5 Per Person) & Individual Sunzest Organic Orange Juice & International Cheese Platter. 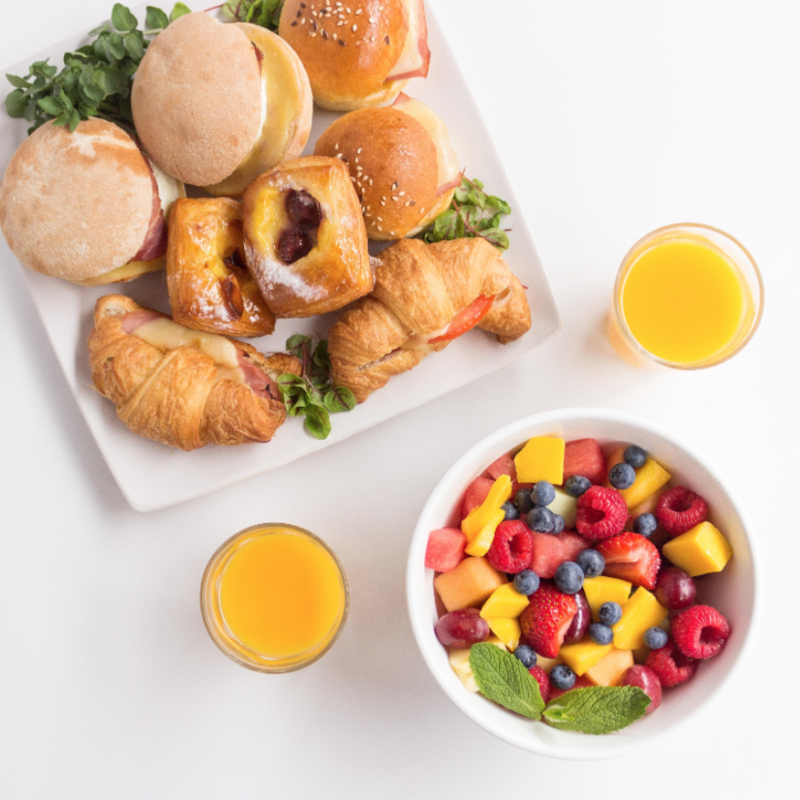 Morning Tea: Selection of mini muffins, mini Danishes, seasonal fruit, orange juice, Lunch: A Selection of Sandwiches, Baguettes & Wraps (1.5 rounds per person) & cheese platter with crackers, water, Afternoon Tea: Selection of Slices & Cakes. Sausage Rolls, Party Pies, Mini Quiches (vegetarian options available) Spinach & Ricotta Rolls (vegetarian) Sheppards Pies. Nori hand roll (cut into pieces) (we offer a variety of fillings chicken, salmon, tuna, chicken, vegetarian), - Sushi nigiri , - Piece of Frittata,- Rice Paper Roll. Your choice of Sandwich Mt Franklin water Chocolate Brownie Apple. A selection of gourmet sandwiches, baguettes and wraps (1.5 rounds per person). A selection of gourmet sandwiches, baguettes & wraps (1.5 rounds per person), individual orange juice, International cheese selection with crackers and a garnish of fruit and nuts. Oven roasted sweet potato, corn, red & green peppers, spiced moghrabieh, semi dried tomato, sunflower seed, chia seed, pecan, sultana, coriander, dukkah, beetroot hummus, pomegranate dressing and puffed quino (NOT GLUTEN FREE) (VEGAN). Spice crusted chicken, sesame bean salad, faro & pine nut tabouleh, dukkah eggs, baby beetroot, hummus and saffron yoghurt. Grilled chipotle chicken salad of adzuki beans, sweetcorn, cranberry, jalapeno, coriander & pepita. Pico de gallo and avocado salsa, sour cream and kasha GLUTEN FREE. Farro, red rice, fresh tuna, green pea, green bean, Gremolata, egg, dukkha, parsley, fresh lime juice and olive oil Not gluten free & Contains nuts. caramel, chocolate brownie, cherry choc or lemon slice. White Chocolate Chip with Macadamia or Milk Chocolate Chip. with dipping sauce (vege) served hot or cold. hand rolls cut into 4-5 pieces, minimum 10. An assortment of mini sausage rolls, mini quiches, mini pies, mini pasties & mini sausage and ricot ta rolls. 5 pieces per person. Egg & Lettuce Sandwich, Fresh Orange Juice, Sweet Muffin & Apple. Egg & Bacon Baguette, Fresh Orange Juice, Sweet Muffin & Apple. Your choice of Sandwich, Mt Franklin water, Chocolate Brownie & Apple. Your choice of Baguette, Mt Franklin water, Chocolate Brownie & Apple. We provide and urn with percolated coffee or tea. We send along milk, sugar and disposable cups. Serves approx. 15 guests per urn. Mineral Water. Recommended 1 for 6 people..
Orange Lemon Lime. Recommended 1 for 6 people..
Orange Passionfruit. Recommended 1 for 6 people.. Diet coke. Recommended 1 for 6 people..
Orange Juice. Recommended 1 for 6 people..